I can't wait to hear them all! THANK YOU to all the poets who have participated over the years and to our wonderful audience who attends year after year. Welcome, newbies, too. If you've never attended, this is the year. We'll have handouts, book guides, treats, and tons of book door prizes! Special thanks to these publishers and their wonderful representatives for bringing the poets to TLA: Penguin Books for Young Readers and Sara Ortiz; Boyds Mills Press and Kerry McManus; Simon & Schuster and Venessa Carson and Michelle Fadlalla; Wings Press and Bryce Milligan; Lisa Di Sarro and Houghton Mifflin Harcourt; Pelican Publishing; Pomelo Books. Each poet will be reading from her/his works-- and there is nothing quite like hearing the poems read by their creators. Once again, I'll try to capture a few moments on video and post those later this spring. 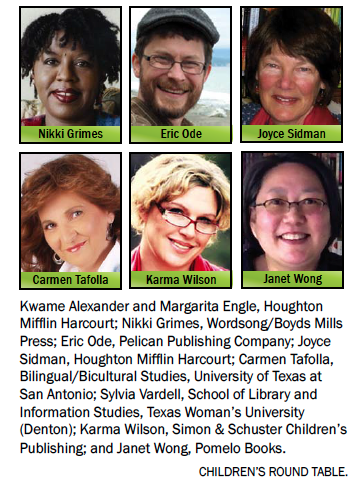 Meanwhile, go look for the wonderful works by these lovely writers. Alexander, Kwame. 2014. The Crossover. Houghton Mifflin Harcourt. Engle, Margaret. 2006. The Poet Slave of Cuba. Henry Holt. Engle, Margarita. 2008. The Surrender Tree. Henry Holt. Engle, Margarita. 2009. Tropical Secrets: Holocaust Refugees in Cuba. Henry Holt. Engle, Margarita. 2012. The Wild Book. Houghton Mifflin. Engle, Margarita. 2013. Mountain Dog. Henry Holt. Engle, Margarita. 2014. Silver People: Voices from the Panama Canal. Houghton Mifflin Harcourt. Engle, Margarita. 2014. Tiny Rabbit's Big Wish. Houghton Mifflin Harcourt. Graham, Joan Bransfield. 1994. Splish Splash. Houghton Mifflin. Graham, Joan Bransfield. 1999. Flicker Flash. Houghton Mifflin. Graham, Joan Bransfield. 2014. The Poem That Will Not End. Two Lions. Grimes, Nikki. 1994. Meet Danitra Brown. Lothrop, Lee & Shepard. Grimes, Nikki. 1998. A Dime a Dozen. Dial. Grimes, Nikki. 1998. Jazmin’s Notebook. Dial. Grimes, Nikki. 1999. Hopscotch Love: A Family Treasury of Love Poems. Lothrop, Lee & Shepard. Grimes, Nikki. 1999. My Man Blue: Poems. Dial. Grimes, Nikki. 2001. A Pocketful of Poems. Clarion. Grimes, Nikki. 2002. Bronx Masquerade. Dial. Grimes, Nikki. 2004. What is Goodbye? Jump at the Sun/Hyperion. Grimes, Nikki. 2005. Danitra Brown, Class Clown. Lothrop, Lee & Shepard. Grimes, Nikki. 2005. Dark Sons. Hyperion. Grimes, Nikki. 2006. Thanks a Million. Amistad. Grimes, Nikki. 2007. When Gorilla Goes Walking. Orchard. Grimes, Nikki. 2013. Words with Wings. Wordsong/Boyds Mills Press. Grimes, Nikki. 2014. Poems in the Attic. Lee & Low. Ode, Eric. 2007. Tall Tales of the Wild West: A Humorous Collection of Cowboy Poems & Songs. Meadowbrook. Ode, Eric. 2012. Dan, the Taxi Man. Kane/Miller. Ode, Eric. 2012. When You're a Pirate Dog and Other Pirate Poems. Pelican. Ode, Eric. 2013. Sea Star Wishes: Poems from the Coast. Sasquatch Books/Random House. Sidman, Joyce. 2002. Eureka! Poems about Inventors. Millbrook. Sidman, Joyce. 2003. The World According to Dog: Poems and Teen Voices. Houghton Mifflin. Sidman, Joyce. 2005. Song of the Water Boatman and Other Pond Poems. Houghton Mifflin. Sidman, Joyce. 2006. Butterfly Eyes and Other Secrets of the Meadow. Houghton Mifflin. Sidman, Joyce. 2006. Meow Ruff: A Story in Concrete Poetry. Houghton Mifflin. Sidman, Joyce. 2007. This is Just to Say: Poems of Apology and Forgiveness. Houghton Mifflin. Sidman, Joyce. 2009. Red Sings From Treetops; A Year in Colors. Houghton Mifflin. Sidman, Joyce. 2010. Ubiquitous: Celebrating Nature’s Survivors. Houghton Mifflin. Sidman, Joyce. 2013. What the Heart Knows: Chants, Charms & Blessings. Houghton Mifflin Harcourt. Sidman, Joyce. 2014. Winter Bees & Other Poems of the Cold. Houghton Mifflin Harcourt. Tafolla, Carmen. 2008. That's Not Fair! / No Es Justo! : Emma Tenayuca's Struggle for Justice. Wings Press. Tafolla, Carmen. 2009. What Can You Do With a Paleta? Tricycle Press. Tafolla, Carmen. 2010. Fiesta Babies. Tricycle Press. Tafolla, Carmen. 2012. Rebozos. Wings Press. Wilson, Karma. 2009. What's the Weather Inside? Simon & Schuster. Wilson, Karma. 2014. Outside the Box. Ill. by Diane Goode. Margaret K. McElderry. Wong, Janet S. 1994. Good Luck Gold and Other Poems. Margaret K. McElderry. Wong, Janet S. 1996. A Suitcase of Seaweed, and Other Poems. Booksurge. Wong, Janet S. 1999. Behind the Wheel: Poems about Driving. McElderry. Wong, Janet S. 1999. The Rainbow Hand: Poems about Mothers and Children. McElderry. Wong, Janet S. 2003. Knock on Wood: Poems about Superstitions. McElderry. Wong, Janet S. 2003. Minn and Jake. Farrar, Straus & Giroux. Wong, Janet S. 2007. Twist: Yoga Poems. McElderry. Wong, Janet. 2008. Minn and Jake’s Almost Terrible Summer. Farrar, Straus & Giroux. Wong, Janet. 2011. Once Upon A Tiger: New Beginnings for Endangered Animals. OnceUponaTiger.com. 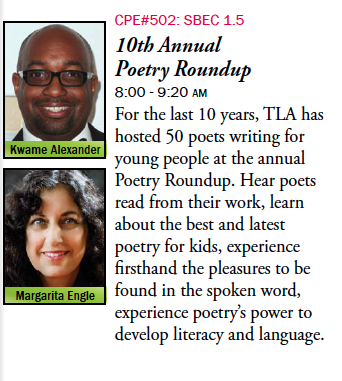 I am so gratified that TLA continues to value this session and keep it on the conference program. Special thanks to the Children's Round Table for sponsoring this popular presentation. Having a poetry showcase during April, National Poetry Month is a fantastic treat! Speaking of National Poetry Month, once again I'm going to try to post daily during April. This year, I'll be showcasing poem movies created by my wonderful graduate students-- teachers and librarians enrolled in my spring course on poetry for children and young adults. They've created some clever, engaging, and evocative mini-movies-- each featuring a single poem from my latest collaboration, The Poetry Friday Anthology FOR SCIENCE with a wide variety of poets and poems highlighted. They've used kids, nature photographs, music, and even LEGOs to make one-minute videos that bring each poem to life! Come back every day in April to check them out. Meanwhile, head on over to A Year of Reading, the fabulous coordinator of all our weekly Poetry Friday celebrations to see what's up around the Web! Please allow me to plug my new project (with Janet Wong) once again... 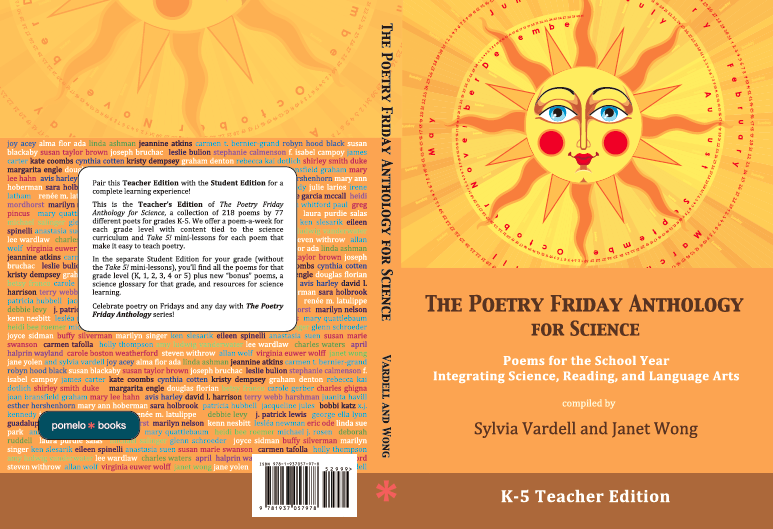 The Poetry Friday Anthology for Science is first and foremost a quality anthology of original poetry for children written by 78 of today’s most popular poets. 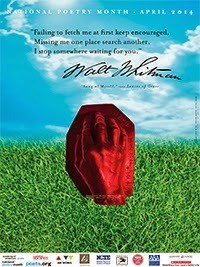 Children in any grade can enjoy, explore, and respond to these poems. However, we have also come to realize that educators, librarians, and parents are looking for guidance in how to share poetry with children and connect with the science curriculum at the same time. Thus, this book offers both: quality poetry organized by grade level plus curriculum-based suggestions in Take 5 mini-lessons for helping children enjoy and understand poetry AND science. In The Poetry Friday Anthology series, we have borrowed the phrase “Take 5” from the great jazz musician Dave Brubeck to advocate taking time for poetry every Friday to introduce and share a poem—in this case a science-centric poem. 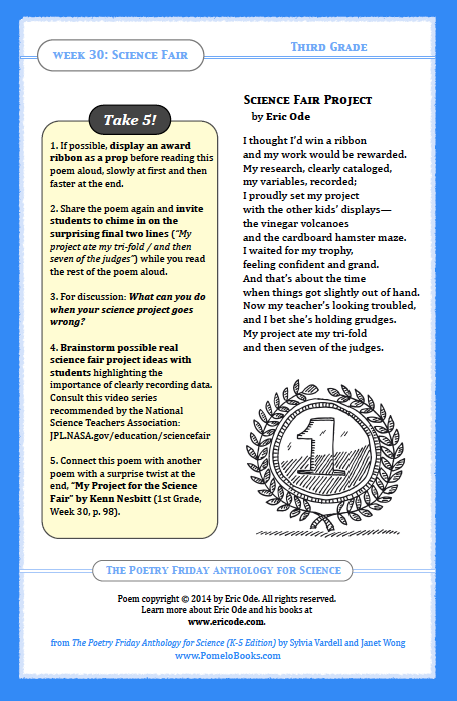 Once again, in our science-themed anthology, we provide “Take 5” activities for each poem to help teachers, librarians, and parents share poems and invite students to listen and read along, plus questions, activities, and book suggestions for considering the science content of each poem. The “Take 5” approach is based on a constructivist model of learning and encourages engagement and exploration in particular. The Take 5! activities provided are tied to the Next Generation Science Standards (NGSS, as well as the science and technology TEKS in Texas) while also incorporating the literacy skills identified in the Common Core State Standards (CCSS). Obviously, poetry sharing doesn’t take the place of planned science instruction, but the two complement each other well. It’s also possible to match poems and science lessons using the weekly themes or the index at the back of the book to identify relevant science topics. 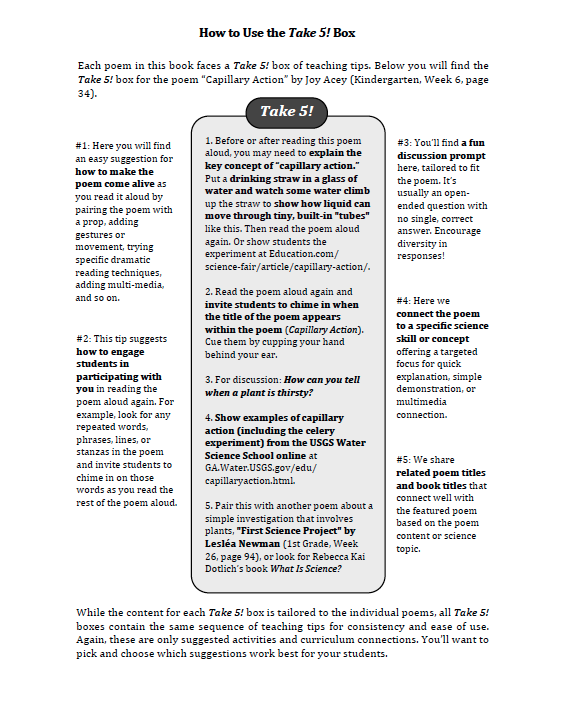 Here are some sample poems and the Take 5 activities that accompany the poems. Naturally, a single poem is not intended to be the entire science lesson, but it offers an innovative, engaging, vocabulary-full, and concept-rich way to launch or conclude a science lesson. Science expert Jill Castek challenges us to “break down those instructional silos” of science and literacy and look for opportunities to maximize overlap. We need to ensure that vocabulary exposure is occurring in many contexts for maximum scaffolding and science learning. In her essay, “Teaching science when your principal says ‘teach language arts,’” Valarie Akerson notes, “It is possible to use language arts to support science learning and to use science as a purpose for learning language arts” (2002, p. 22). And Royce, Morgan, and Ansberry (2012) confirm “studies have shown gains in literacy as well as science achievement in programs that blend science and literacy instruction” (p. 6). Whether we introduce a poem at the beginning of the day, when transitioning to lunch or at a break, tied to a science lesson, or for wrapping things up, “breaking” for poetry provides a moment to refresh and engage. This doesn’t mean that a more in-depth study of poetry as well as science is not a good idea. Of course it is. But for the average teacher or librarian, consistently sharing a five-minute poem break is an effective practice for injecting poetry into the routine. And with these science-themed poems, we offer the added bonus of infusing science content into this language experience. Get your copy of The Poetry Friday Anthology for Science now and be ready for National Poetry Month in April. Head on over to Rogue Anthropologist for this week’s Poetry Friday gathering. See you there! It's been one week since Janet (Wong) and I released our latest project, The Poetry Friday Anthology for Science, and we've been blown away by the response! We're so proud of the book and so excited about the crossover possibilities for science and poetry in the classroom. But we're also very excited about the latest innovation: Student Editions for each grade level! In addition to the massive Teacher's Edition that follows our usual format of a poem-a-week for grades Kindergarten through fifth grade, we are also publishing Student Editions that feature the poems for each individual grade level (with no Take 5! mini-lessons). And each of those books includes five "bonus" poems as extras! PLUS, these books have art! We've included fun black-and-white sketches for each poem to add visual interest. 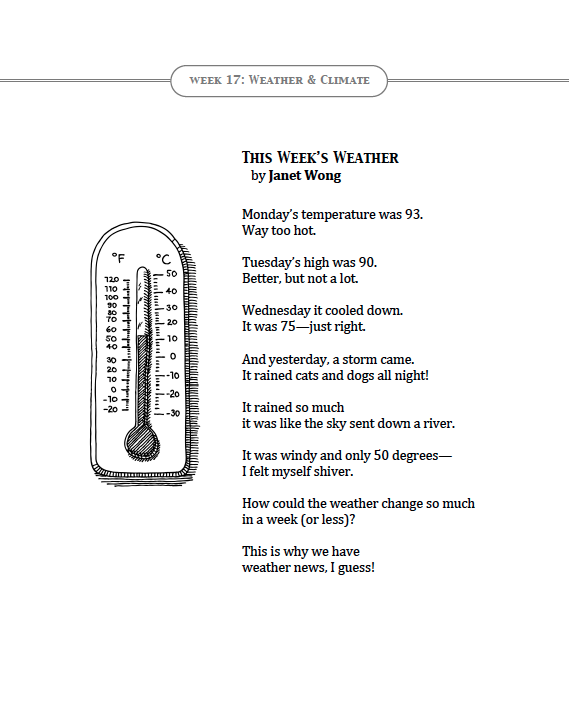 Weather-related poems are always fun, don't you think?! Special thanks to German artist Frank Ramspott and Taiwanese artist Bug Wang for their art for our student editions! Get your copies now at Pomelo Books! Now head on over to Reflections on the Teche for the Poetry Friday gathering. The latest recipient of the Lee Bennett Hopkins Award was recently announced. 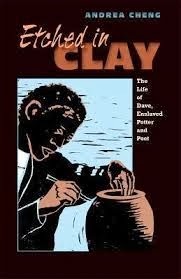 This year’s winner is Etched in Clay: The Life of Dave, Enslaved Potter and Poet written by Andrea Cheng, with woodcuts by the author, published by Lee & Low Books (2013). The award and a $1000 prize, courtesy of award founder Lee Bennett Hopkins, will be presented at Penn State University in the fall. And for resources for sharing the previous award and honor books, look for the Lee Bennett Hopkins Poetry Award Teaching Toolbox. I'm excited to report that the latest installment of The Poetry Friday Anthology is out-- and it's SCIENCE focused! 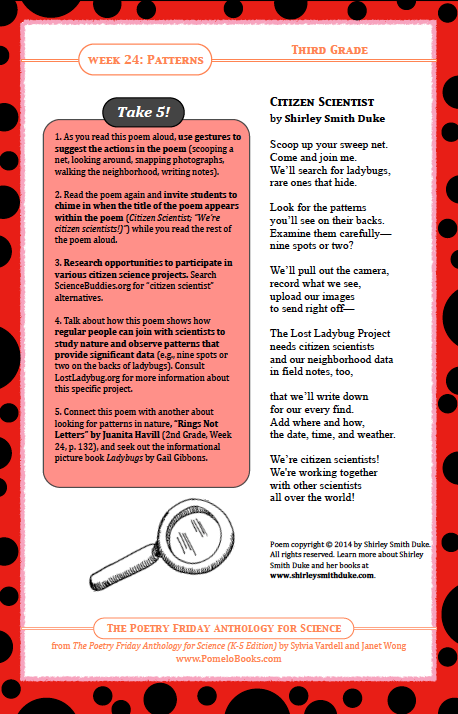 ALL the 200+ poems are science-themed and once again we provide Take 5! mini-lessons for every poem to help teachers, librarians, and parents share the poems with children (grades K-5) while building science knowledge AND literacy. We have 218 poems by 78 poets! We offer a poem-a-week for Kindergarten, 1st grade, 2nd grade, 3rd grade, 4th grade, and 5th grade (for Poetry Friday or ANY day). Every poem has a 5-step (Take 5!) mini-lesson with connections to the new Next Generation Science Standards (NGSS). For the first time, we're also publishing Student Editions with just the poems (no mini-lessons) for children-- accompanied by fun black-and-white sketches. I'll be posting more about this new book throughout the month, but for now I'm thrilled to say, "It's OUT!" To get your copy, go to PomeloBooks.com.